Salt also built, in less than 20 years, homes for 4300 people (workers, managers, and their families) on the property, to guarantee his people’s living conditions. The stone cottages that survive are valued properties today (on the low end, ca. $225,000 for 720 sq. ft.) in a gentrified post-industrial landscape outside Bradford. 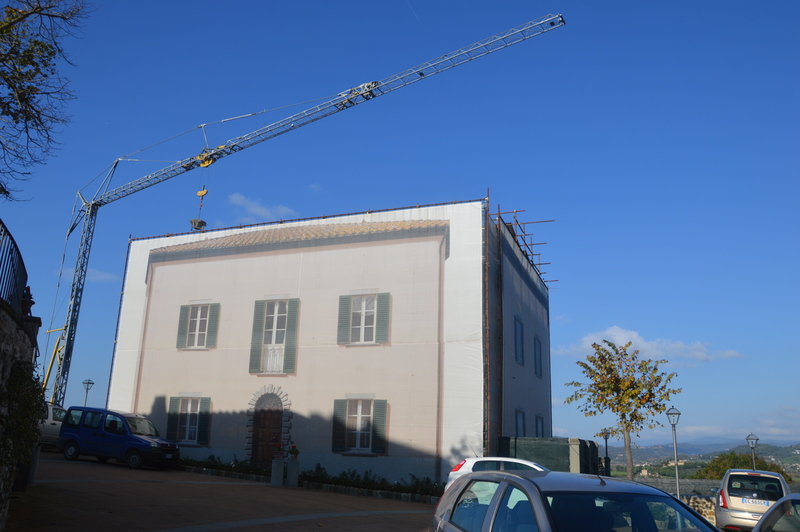 Building under reconstruction in Solomeo, complete with digitally-printed full-scale screens on the outside of the scaffolding that shows, on each side of the house, what the structure will look like when complete. 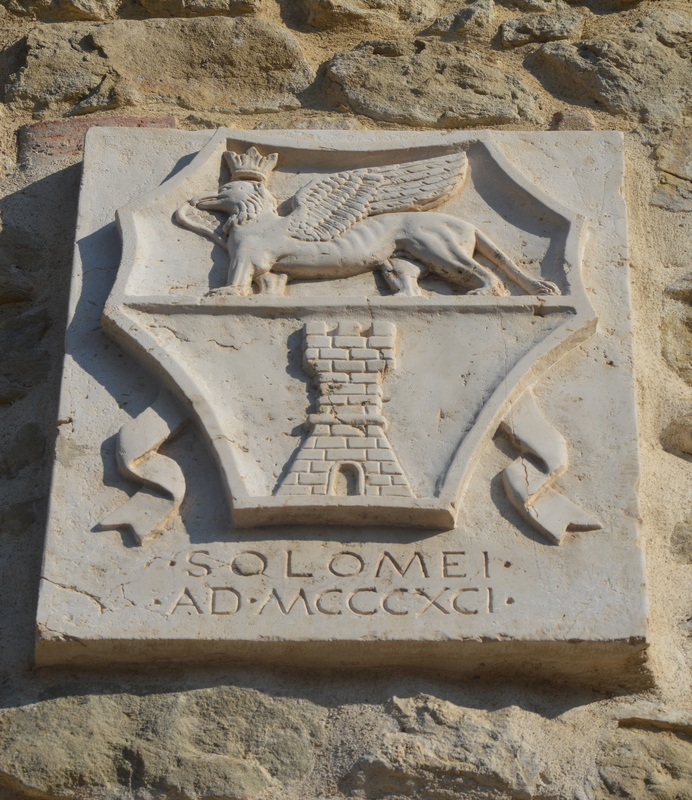 Solomeo is enjoying a parallel renaissance; Cucinelli has purchased most of the old village buildings, and is consolidating and refurbishing them for company purposes or residents’ dwellings. 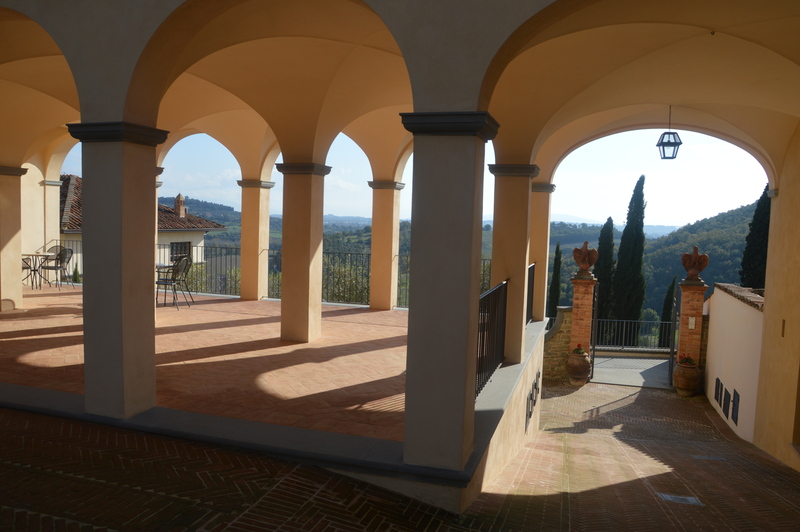 He has also had new houses built that keep with the village aesthetic. 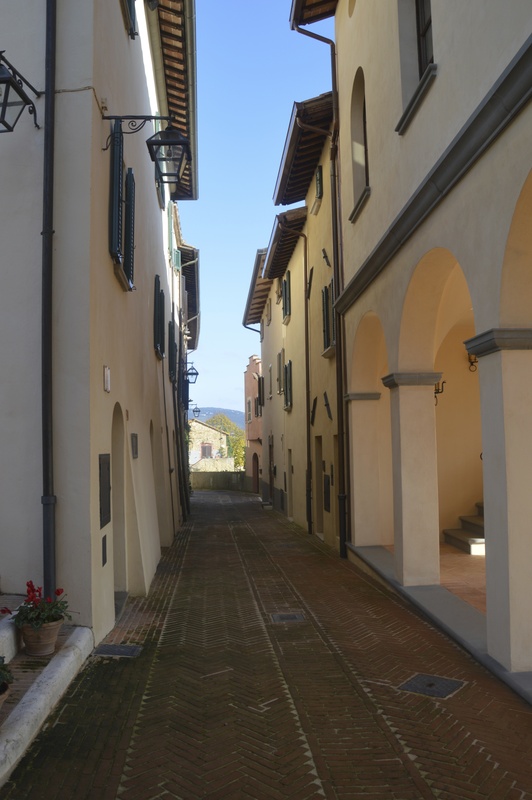 In fact, there is so much new plastering and painting, perfectly swept-and-kept streets, that it almost doesn’t look like an Italian town at all. 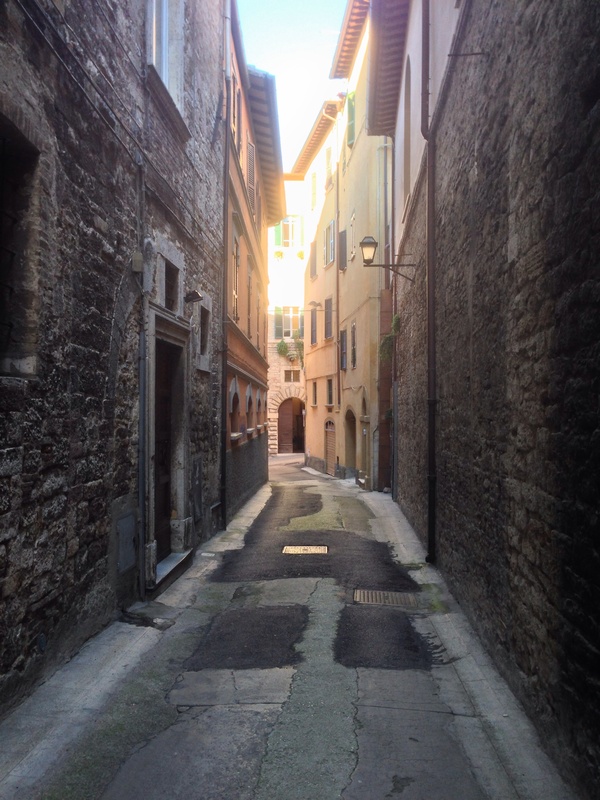 There is none of the ‘beauty of ruins’ — bits of exposed stone and patched, crumbled brick with spots of faded, buckling plaster, worn and peeling shutters — which marks the weathered personality on every street in the centro storico of Perugia. 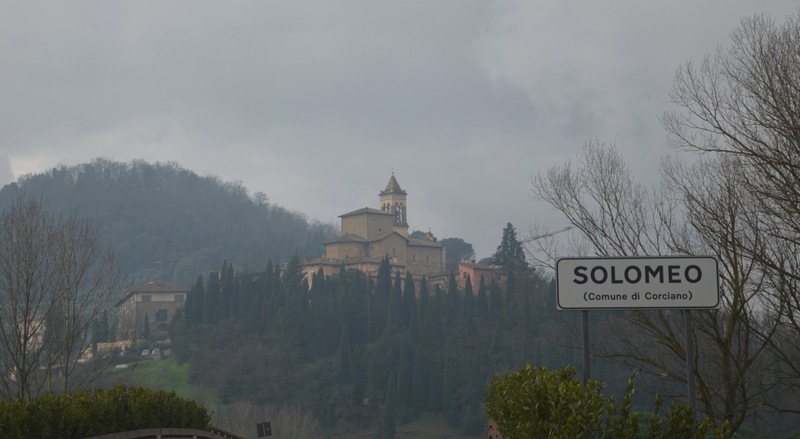 And so, Solomeo looks more like California. 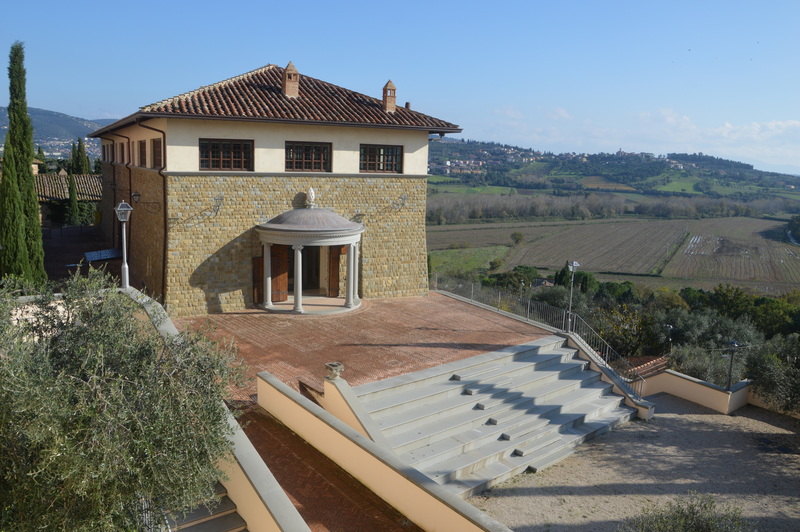 Olive trees are everywhere, gripping steep slopes around the town in planted rows, but also accenting staircases and gauntleting the plaza in front of the Teatro Cucinelli, which was preparing that day for a performance of the Goldberg Variations by pianist Ramin Bahrani. 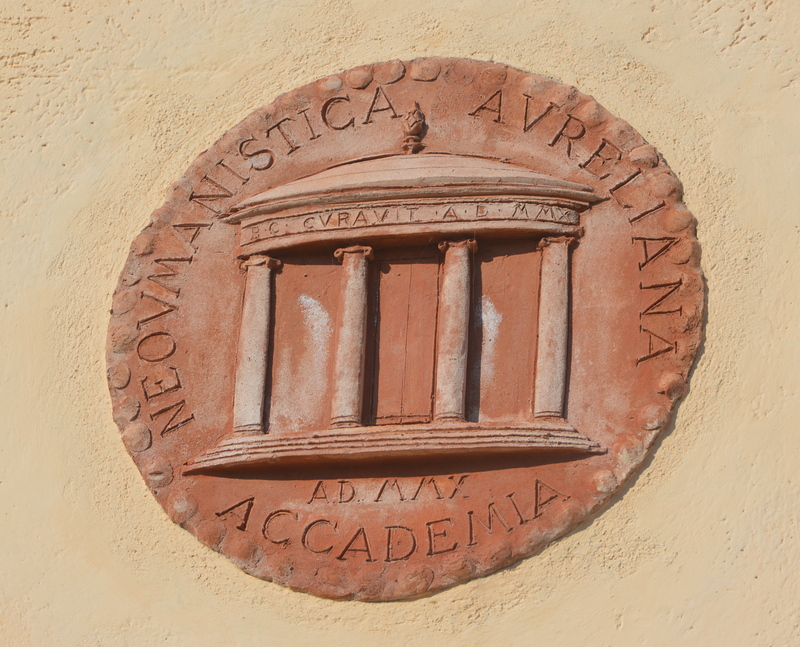 The theater flanks a building designated as the ‘Accademia Neoumanistica Aureliana‘, the locus of a library and retreat for thinkers in art, religion, business, and the sciences. Colloquia are also held here (see the Fall 2013 schedule above). The appellation ‘Aureliana’ seems a reference to the Roman emperor and Stoic philosopher Marcus Aurelius (reigned AD 161-180): “…nothing is good for a human being which does not make him just, temperate, courageous, free; …nothing is bad, which does not make him the contraries of the aforementioned.” (8.1). Judgement (exercise discernment in your assessments). Aurelius did not articulate a coherent philosophical system — more a series of reminders and admonishments; his aphoristic style makes him “among the most quotable of philosophers.” In line with Aurelius’ literary approach, Solomeo is rife with quotes — ceramic plaques with sayings from writers, philosophers, scientists, and leaders. 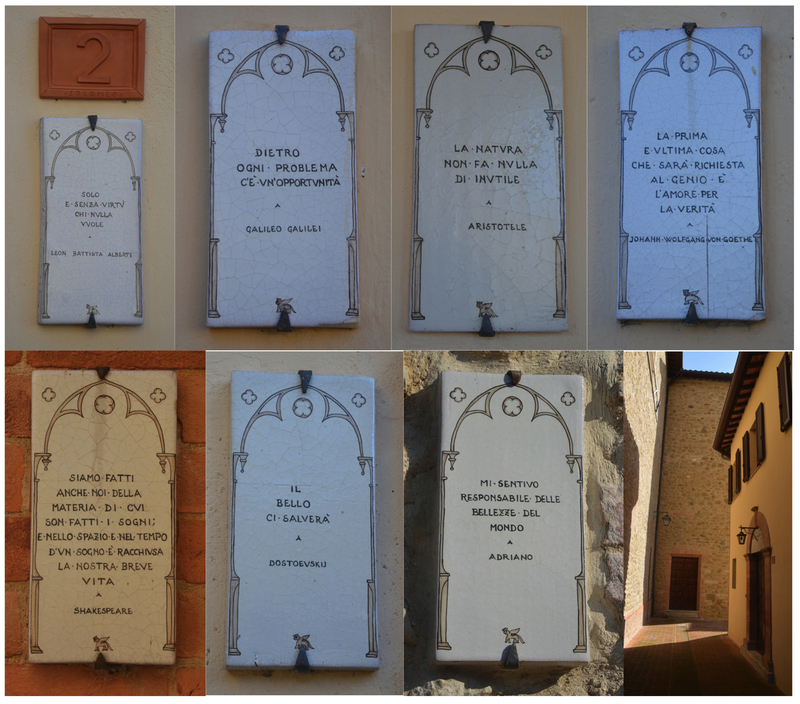 They are posted on village buildings restored by Cucinelli. The last quote is particularly interesting. These are words not in fact from the Roman emperor Hadrian (ruled AD 117-138), but given to him by author Marguerite Yourcenar in her celebrated novel “Mémoires d’Hadrien” (Paris  148): “Je me sentais responsable de la beauté du monde” (“I felt responsible for sustaining and increasing the beauty of the world,” in G. Frick’s English translation). In this case, fictional words stand for a preferred characterization of an emperor whose passions were art, architecture, and travel. 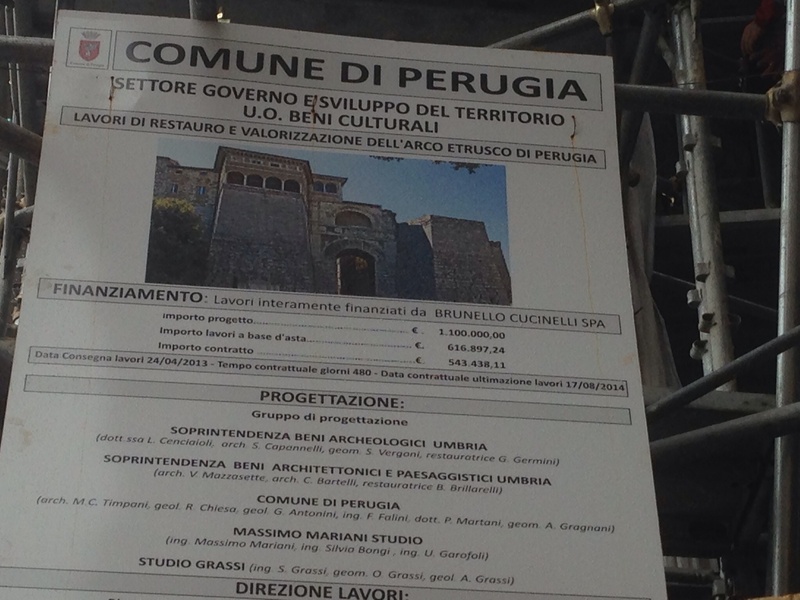 In that way a literary, not historical, quote makes sense for Cucinelli, and he uses it frequently. Yourcenar’s book about Hadrian happens to take the form of a letter to the young and future heir, Marcus Aurelius. Some of the ideals of these two widely-traveled emperors — the esthete and the philosopher — may have seeped into Cucinelli’s publicity campaigns. Fall/Winter 2003/04 shows an intrepid philosopher-king leading a symposium at the top of the world. Open books and convivial beverages are front and center, but conversation and contemplation remain the focus of the image; the “Better World” of the title might stem from: “the vital force of a collective desire for renewal, fraternity and joy” in the text that accompanies the poster. Six years later, we see a Mongolian celebration at the source of the cashmere that underpins the wealth of the entire enterprise. There is still the sharing of sustenance, but it is jocular. 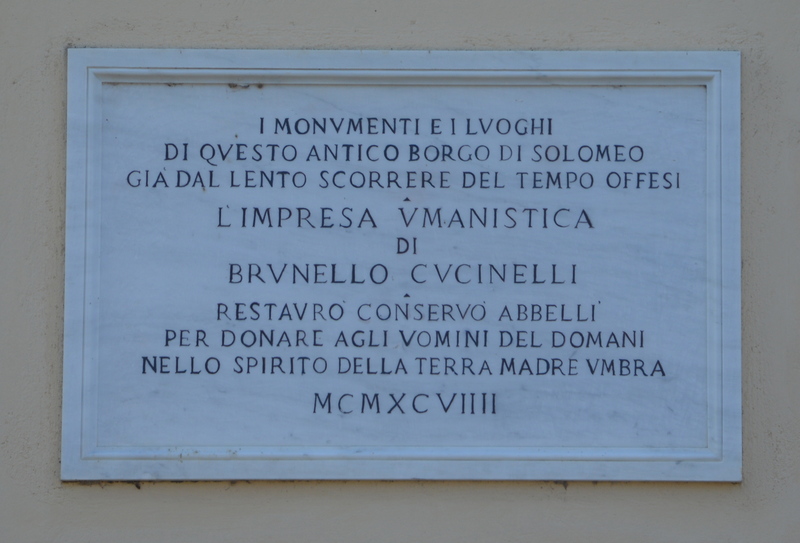 This is one significant break that Cucinelli seems to make with classical Stoicism: a valuing of emotion. The text accompanying the poster also makes a historical connection, telling the story of a Franciscan brother, Giovanni di Pian di Carpine, an Umbrian native (born just a few miles from Solomeo) who led the first western excursion into Mongol lands as a papal emissary to the court of the Great Khan, from 1245-47, some 26 years before the young Marco Polo hit the road. (You can read the friar’s account in Hildinger’s recent English translation of the Historia Mongalorum.) 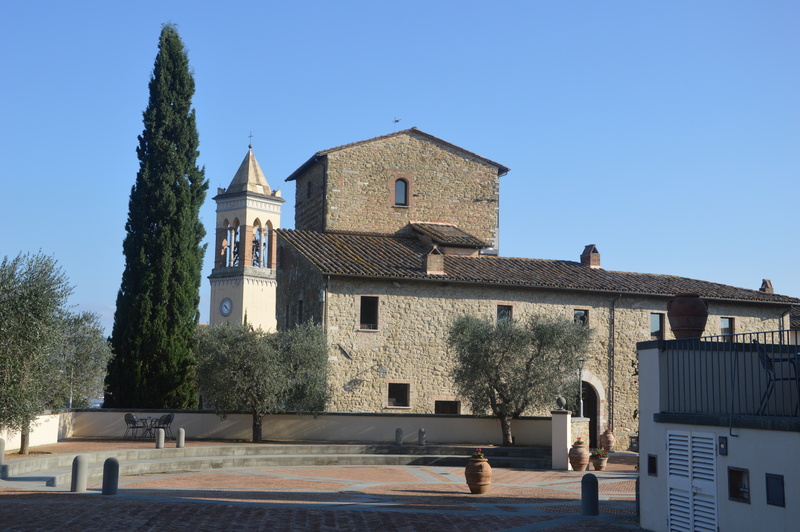 While Giovanni did not mention cashmere in his writing, Cucinelli uses the Umbrian connection as a “thread” to weave his own company into the deep narrative of East-West relations. Ultimately, every person — philosopher, adventurer, or ruler — longs to return home, and somehow to a home that is both honest to the pictures in one’s memory, and yet somehow made better, more beautiful, by one’s experience in the larger world. The gap between what is and what was, buzzing with fear and fondness, is nostalgia. The latest Cucinelli campaign (above), continuing recent series that feature Italy, brings it back hearthside to a school room, where elders instruct and children listen to their stories and wisdom. It focuses on learning, exploring the large and the small (see the globe at right alongside the scientific drawings), and on shared bonds of respect and affection. It is an image of highly traditional virtues. The shops inside carry his clothing lines, most featuring his signature cashmere fabric. The attendants in the stores are graceful and friendly. There’s no doubt — the clothing is gorgeous. But even with the 30% local-store discount, a men’s suit coat exceeds $2000. The luxury of resuscitating idealized traditions comes from selling products that only the 1% can afford. It’s his market position; Cucinelli cannot discount within reach of working-class customers; if he did, he’d lose his brand’s caché. For the farmer’s son, it is an ironic bind that he addresses by investing in his local communities. Near the end of our visit, I was talking to a clerk about a medieval fresco that hung on the wall behind the cash register. She directed me to a book on one of the display tables. It was entitled: Solomeo. Brunello Cucinelli. Un’impresa Umanistica nel Mondo dell’Industria (“Solomeo. Brunello Cucinelli. A Humanistic Enterprise in the World of Industry”). 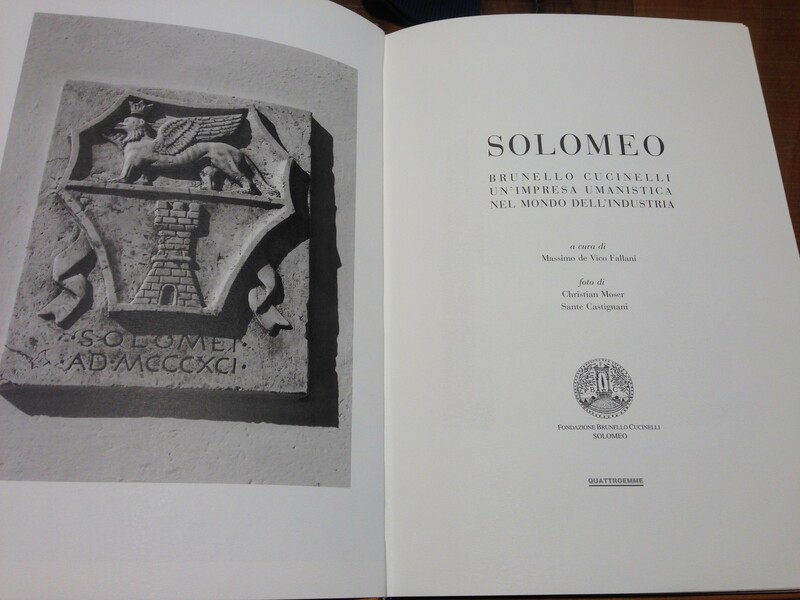 Inside were pictures of another fresco on the upper floor of the building, but the book was really an encapsulation of Cucinelli’s thinking and initiatives, with a memoir section, and chapters on his ‘new humanism’ philosophy and the history and conservation of Solomeo. I asked whether it was for sale. “Keep it,” she said, though it was the display copy (she even apologized for its slightly worn condition); more copies apparently were on their way from the Quattroemme publishers in Perugia. Only much later, as I searched the title to find out more about its production, did I see how difficult and expensive it is to obtain on the secondary market. I have yet to read through all of its 168 large-format pages, but I did notice this at the end of the Foreword (p. 11): Ritengo che ognuno di noi, con il proprio, interagisce con l’ambiente, e anch’io, per la mia parte, mi sento degno e responsible dell bellezze del mondo (“I believe that each of us, on our own, interacts with the environment, and I, for my part, feel worthy and responsible for the beauty of the world”). Here is a Stoic concern for a living harmony with nature (both the human and environmental worlds), the humanistic belief that beauty itself is highly worthy, and an almost aristocratic declaration of responsibility for maintaining and improving beauty in the world. 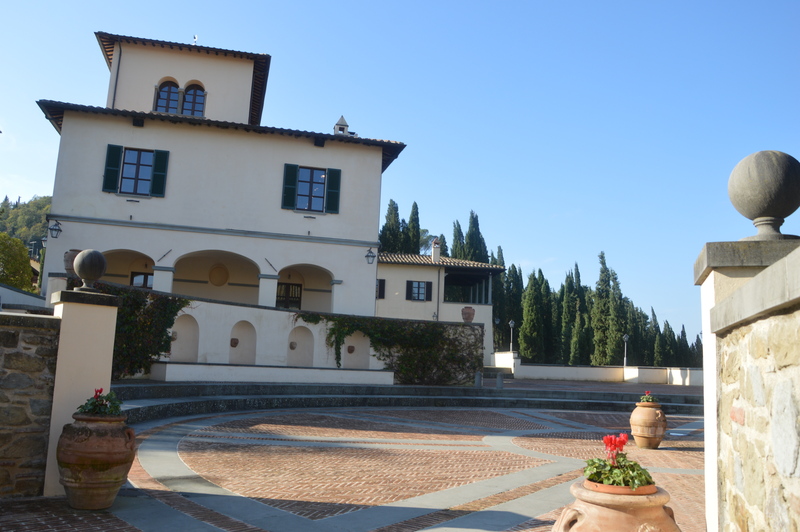 In the Forbes interview, prior to the IPO this past spring that made him Italy’s newest billionaire, Cucinelli said, “I am looking for the custodians who will control the company for the next 50 years.” Long-term thinking in a myopic modern market. Like Hadrian and Marcus Aurelius, he is concerned with succession, and perhaps especially about his legacy — the solid construction of a past that can operate meaningfully in the future. One place he is building it is Solomeo. Utterly fascinating. A brilliant profile. His speaking the words of Hadrian (“beauty of the world” quote at the end of the Solomeo book) as Yourcenar would have them is both stunning in its hubris and wonderful in its effect. Yourcenar’s memoirs of Hadrian is one of my favorite books of all time – it’s incredible to see words from it alive in Solomeo. Thank you (for this and all your posts!). Pedar! We’re coming to France mid-July via Iceland – meet you in Iceland? hike a glacier together? 🙂 We’ll have to keep working on this, as for now, it’s looking too much like sabbatical ships in the night. It was great to see the boys laughing and talking together yesterday on GoogleHangOut – and I even got to see and speak with lovely Rebecca! Your writing on Solomeo was magical. So ironic that only the wealthy can afford the clothing that is the source of funding the idyllic philosophy. Such philosophy is the stuff of dreamers-beautiful but unattainable in the world we inhabit. The philosophy of so many great leaders, who desired to continue their aspirations after their demise, liquified in the hands of those who followed them. Cool. Very interesting on many levels, perhaps some not known or seen yet as this progresses. Pedar, this also reminds me a little bit of the Moravian town of Zlin (Czech Republic) where Thomas Bata (yes, the shoe company) did something similar. Thank you, Julia, for that reference; it is fascinating! The Bata story can be found here: http://www.bata.com/our-history/. It is also worth noting that Bata founded a foundation (http://www.batova-vila.cz/EN/Thomas-Bata-Foundation-TJB.html) and a university (http://www.utb.cz/) in his hometown of Zlin, again showing the urge to create a lasting local legacy from worldwide success. (It is interesting that Bata has not entered the American market.) Two weeks ago we got shoes for Micah at Bata here in Perugia, without knowing the story; thanks! I remember I got totally into the Bata story when I was in the Czech Republic in 2005. Unfortunately, I never made it to Zlin, but it’s on my list of must-sees. I wish they would start selling in the US, too.